ENGLEWOOD CLIFFS, New Jersey, Feb. 4, 2019 /PRNewswire-HISPANIC PR WIRE/ — Unilever – the global leader in deodorant and antiperspirant innovation – continues to meet the ever-changing needs of shoppers by expanding its portfolio to include formats designed for on-the-go lifestyles. The wipes, which provide a superior and hygienic on-the-go experience, are also ideal for waterless activities like camping and hiking. In addition, the new wipes can be used alone or as a fresh complement to one’s antiperspirant or deodorant of choice. Unilever’s Deodorant Wipes – currently offered in seven variants – are available in a 25-count pack, carry a suggested retail price of $4.98 – $5.99 and are on shelves at food, drug and mass retailers nationwide. In addition to Unilever’s new Deodorant Wipes, the beauty and personal care parent company now also offers mini, 1-oz. Dry Spray Antiperspirant Deodorants by Dove, Dove Men+Care, Degree® Women and Degree® Men for on-the-go sweat protection. Based on best-selling fragrances, the new mini Dry Sprays are the perfect complement to travel carry-ons, gym bags and any place where an extra spray of sweat protection may be required. The new mini Dry Sprays retail for $1.99 and are available at food, drug and mass retailers nationwide. 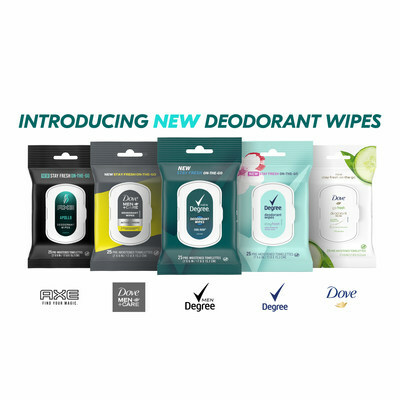 Shoppers will see support for Unilever’s new Deodorant Wipes and mini Dry Sprays in-store as well as via social media, national advertising and sampling initiatives. Unilever is one of the world’s leading suppliers of Personal Care, Food & Refreshment and Home Care products with sales in over 190 countries and reaching 2.5 billion consumers a day. In the United States, the portfolio includes brand icons such as Axe, Ben & Jerry’s, Breyers, Caress, Degree, Dollar Shave Club, Dove, Good Humor, Hellmann’s, Klondike, Knorr, Lever 2000, Lipton, Love Beauty and Planet, Magnum, Nexxus, Noxzema, Pond’s, Popsicle, Pure Leaf, Q-tips, Schmidt’s Naturals, Seventh Generation, Simple, Sir Kensington’s, St. Ives, Suave, Sundial Brands, Talenti Gelato & Sorbetto, TAZO, TIGI, TONI&GUY, TRESemmé and Vaseline. All of the preceding brand names are trademarks or registered trademarks of the Unilever Group of Companies.